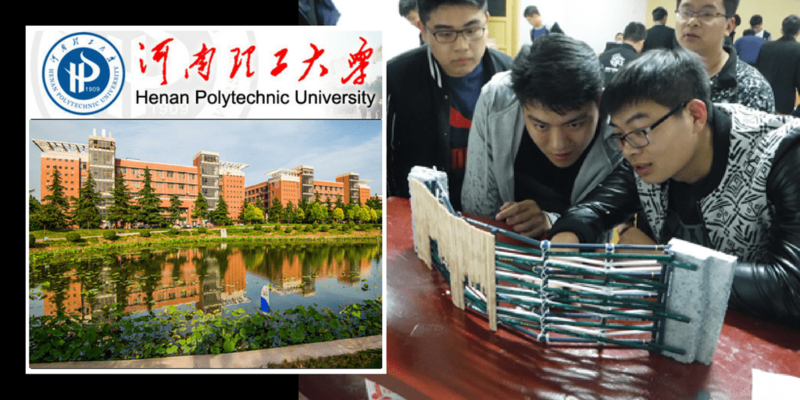 I teach Civil Engineering in China at The Henan Polytechnic University (HPU). With a long history, it is the first mining university in Chinese history as well as the earliest higher college in Henan province. Its former is Jiaozuo Coal Mining School, which was established by the British Syndicate Co. Ltd., in 1909. During my time at HPU, I have developed a bespoke Research Informed Teaching (RIT) method for English Civil Engineering module delivery. I have designed and written The CIMMS Framework (Computer 3D modeling, Illustration, Model Making and Sketching) ethos, combining four vital elements in a single Engineering English module. Technical Communication and Professional Skills are delivered over a semester, this Development (D) aiming primarily to prepare HPU students for industry. The International English Language Testing System (IELTS) is used and widely recognized as a reliable means of assessing the language ability of HPU civil engineering students. To complement the CIMMS initiative within the English module, a Direct Method for the teaching of the English language has been adopted and integrated. The aim of this method for teaching English is to completely immerse the students in English, I use Engineering objects, models and materials, visual aids along with laboratory demonstrations to teach Engineering English to HPU students. I cannot speak Chinese; the students therefore are forced to only speak English to communicate with me in class or at tutorials. Specific teaching methods include students presenting their work as a team, group site visits, model making teams, painting, sketching, reading out aloud, question and answer exercises, conversation practices, dictation and group discussions, Fig 1., on civil engineering, material science with news and current affairs. Students tend to process at higher intellectual levels when collaborating than when working individually (Entwistle & Peterson, 2004). A revolutionary idea has value only if it can be effectively communicated. For our future civil engineers to imagine, create and design our infrastructure that has a lasting impact on society, they must know how to present and discuss their designs in a manner that is understood by all civil engineers across cultural and geographical boundaries. CIMMS Framework (Computer 3D modeling, Illustration, Model Making and Sketching). One of the best ways to communicate one’s ideas is through some form of image or drawing. This is especially true for the civil engineer. A detail drawing or computer image is a tool used by civil engineers to communicate their designs to clients, manufacturers, colleagues and to preserve their work for future generations. Sketching within the CIMMS initiative means freehand visualization, often initially considered difficult by students. Drawing is defined as using drawing instruments, from compasses to computers to bring precision and accuracy to the drawings. Any engineering drawing should show everything: a complete understanding of the object should be possible from the drawing and its annotations. CIMMS involves studying drafts and examining the practicality of the design; students ensure that the design can withstand normal and extreme loading conditions. 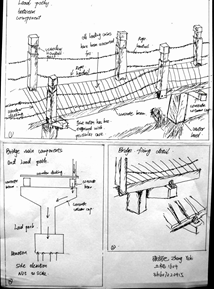 The CIMMS is an exercise programme to help our future civil engineers improve their sketching and visualisation skills, Fig. 2. Starting with simple sketches to develop spatial literacy, the exercises boost their ability to draw ideas in a professional manner. Engineers think, design, and communicate through their illustrations. Their directness and simplicity makes them the perfect vehicle for showing the complexities of their design in an easily understood format. However brilliant their idea is, if the client can’t understand its value, it won’t get very far. CIMMS instructs our students the basics of what’s referred to as visual note taking. Illustrating can help generate ideas, fuel collaboration and simplify communication. It can be especially helpful among global colleagues who don’t share a common first language. Putting pencil to paper also is seen as an antidote to the pervasiveness of the digital culture, getting engineers to look up from their electronic devices and communicate. Given proper detail drawings, clients, manufacturers and contractors know exactly how elements are created without the need for additional verbal explanation from civil engineers. A detail illustration stands on its own, and provides a record of the civil engineer’s precise intent. Well-crafted detail illustrations preserve creative work from one generation to the next. Recent interest in exploring the benefits of using research as a pedagogy has found that there are many links to be made between research and teaching and that these provide valuable participatory and active learning experiences for our HPU civil engineering students. Research Informed Teaching (RIT) is recognition of a paradigm shift in teaching at university level where the emphasis has moved to how our civil engineering students actively make sense of what they are taught rather than passively accruing knowledge (Healey, Jenkins. 2009). Part of this process involves progressively encouraging students themselves to become active enquirers, which is why RIT is of such importance at HPU. The HPU curriculum and the assessment allow students to produce work that is close to the research processes within that discipline. This means that students begin to think like a ‘civil engineer’ or a ‘scientist’ and understand how knowledge is constructed and disseminated in their field. This involves going on site trips to study the local construction methods or developing laboratory skills in measuring levels of concrete degradation, for example. The aim of RIT is to encourage our students to develop into rounded and employable graduates who can take their place confidently as global civil engineers in the 21st century with an appropriate knowledge base, a deep understanding of its limitations as well as its potential, and a desire to apply and add to new knowledge. Our students our encouraged to read current research papers and papers about their lecturers’ own published research, how to carry out research themselves and how to work in a research ‘mode’, which builds on powerful pedagogical principles of enquiry-based, active, collaborative and experiential learning. HPU civil engineering students who stand out from the crowd have invested the extra time in developing their familiarity with foreign academic culture in general, while seeking out ways to learn how English is used in real-world engineering settings. I refer to this as Engineering English (EE). By organizing words into logical word families and word types, the initiative can highlight the formulaic multi-word units that engineers most commonly use in their technical communication within industry. 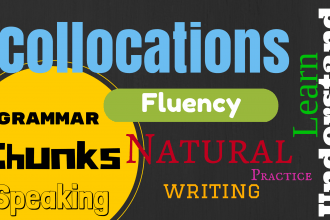 The EE initiative uses a Direct Method for the teaching of the English language. Questions are often raised about this method: the principle concern is how to safeguard against misunderstanding without translating, without reference to the first language (Liu, Shi. 2007). It is stressed to students every lesson that they are welcome to stop the lecture at any time if they do not understand any phrase. The bond between lecturer and student improves over time, giving the student confidence. A class monitor may also stop the class. The lesson schedule, Laboratory programme or site visit is discussed in detail, any misunderstandings are also avoided at tutorials. When HPU students begin their studies abroad, immediately after arriving in the foreign country, they often get overwhelmed by the shock of adjusting to a new culture, a new language and a new approach to learning. The HPU/EE program is one way to address these issues before they can have an impact on a student’s academic performance. Even if the student considers their English skills are high, they can still benefit from some intensive preparation before beginning a foreign academic program. The more our students learn how to communicate in the classroom or workplace with other civil engineers from around the world, the better they will do in the civil engineering industry. The term holistic refers to an understanding of a phenomenon or structure in terms of an integrated whole, whose properties cannot be deduced from the sum of the properties of the constituent parts. To further understand this novel initiative in accordance with the holistic approach, the integration of my experience and observations recorded throughout this article will be considered as an integrated whole. When addressing a complex problem, the whole system can be decomposed and organized into hierarchical subsystems. But those subsystems, e.g. 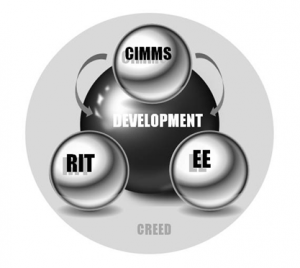 CIMMS, RIT, EE or D, are not independent; they must be integrated into a whole; the CREED Holistic Model, Fig 3. Computer 3D modeling, Illustration, Model Making and Sketching. Figure 3. THE CREED; A Holistic model. In a systematic approach, something to be explained is viewed as part of a larger system and is explained in terms of its role in that larger system. The system concept is more interested in analysing things together rather than in taking them apart. As the moon circles the earth, dependent on each other, CIMMS, RIT and EE virtually orbit development ensuring equilibrium. The systematic mode of thought, when applied to the CREED concept, is called the systems approach. It is based on awareness of the essential interrelatedness and interdependence of all phenomena – physical, psychological, social and cultural (Capra, 1982). and takes into account the concurrent interaction of many factors occurring within the initiative. A shift in the science of linguistics from a reductionist to holistic approach is also necessary before one can develop more accurate systematic test methods, specifications and relevant modules that are truly applicable to the civil engineering industry. Absence of the holistic system concept in designing, implementing modules is clearly demonstrated in the current examples of teaching elsewhere. The CREED holistic model used by myself has shown great promise but requires further research, data acquisition and evaluation to appreciate this opportunity. The concept has a future role to play in linguistics, but is constrained by the great variation of standards. It is clear to those who teach in Asia and its management, that new societal paradigms are needed if Chinese civil engineering students along with holistic strategies are to be developed and implemented. A systematic approach to student performance, civil engineering teaching and English instruction is necessary. Selection of methods and decisions should be more rational and choices should consider long term rather than short term performance. Teaching methods used in general, have to avoid a reductionist approach, favouring a holistic performance criterion. The combination of RIT/CIMMS/EE has a significant effect upon the students’ advancement. I feel the model has been validated through results. IELTS grades are impressive, extra curriculum activities such as ‘English Corner’ is encouraging. Students entering ‘English Speech competitions’ have sought guidance and achieved top three placements. Every educator wants to encourage our Chinese students to develop into rounded and employable graduates and researchers who can take their place confidently as civil engineers in the 21st century with an appropriate knowledge base, a deep understanding of its limitations as well as its potential, and a desire to apply and add to new knowledge. Capra, F. (1982). The Turning Point. London : Harper Collins. Relationships with study behavior and influences of learning environments. International Journal of Educational Research, 41(6), 407-428. LIU Qing-xue, SHI Jin-fang. (2007). An Analysis of Language Teaching Approaches and Methods, Effectiveness and Weakness. US-China Education Review, ISSN1548-6613, USA. Volume 4, No.1.